Join us for Le Grand Slam Guignol, a fun and somewhat bewildering exercise in free form theater of the absurd by Matt Freedman and Jude Tallichet, for the Flux Factory exhibition Public Trust. September 8th is the night that the US Tennis Open’s Women’s Finals will be played, starting around 8 pm. 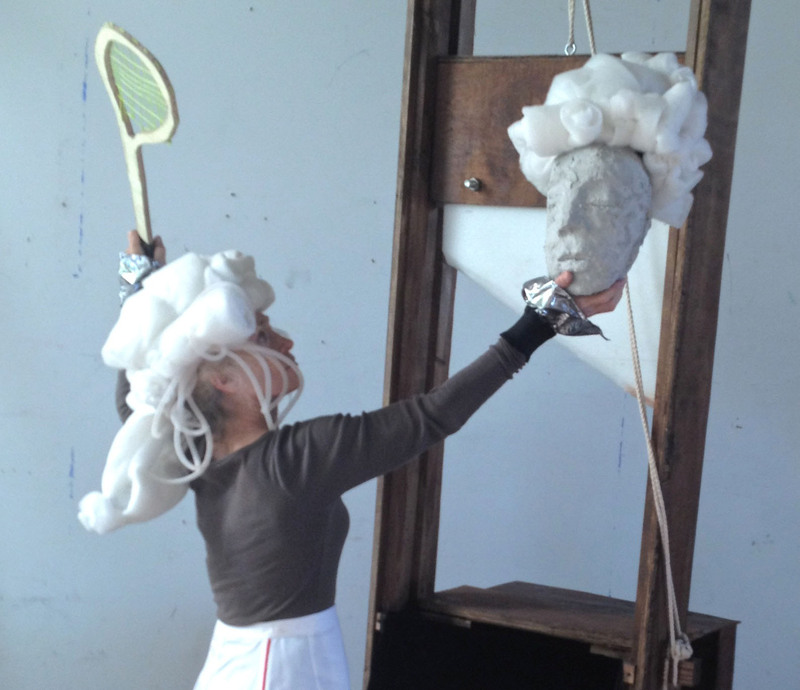 Freedman and Tallichet will project the television coverage of the match onto the walls in the Flux Factory gallery, and participants will play along as the match unfolds, duplicating every serve, return, and drop shot. The court in the gallery will be altered into a semblance of an old court for playing jeu de paume, which is/was the forerunner of modern tennis. It was in such a court in 1789 that the famous “Tennis Court Oath” took place, sparking the French Revolution and the subsequent reign of terror that followed swiftly. The goal of this performance is to engage with both the spectacle of the contemporary televised sporting event and with tennis’ strange historic connection to revolution. To that end, two live “players” (volunteers from the audience), dressed in a combination of contemporary and 18th century tennis drag, little tennis dresses and puffy white wigs, will pantomime the ongoing “real” game on TV, aided by a referee and various other folks. At the end of the game the loser will meet with merciless justice: they will be led to a guillotine conveniently located at the foot of the court and decapitated. Their head will then be mounted on a pike and displayed to the cheering populace. Of course not really; the guillotine and blood are fake and the head will be made of papier mache. The losers will, however, be given tasteful red ribbons to tie around their neck. Given that the match could go as long as three sets and involve as many as 39 games, there will be lots of chances to play. At the end of the performance, the court, the heads and anything else that seems appropriate will remain on display at the gallery for the remainder of the Public Trust show.